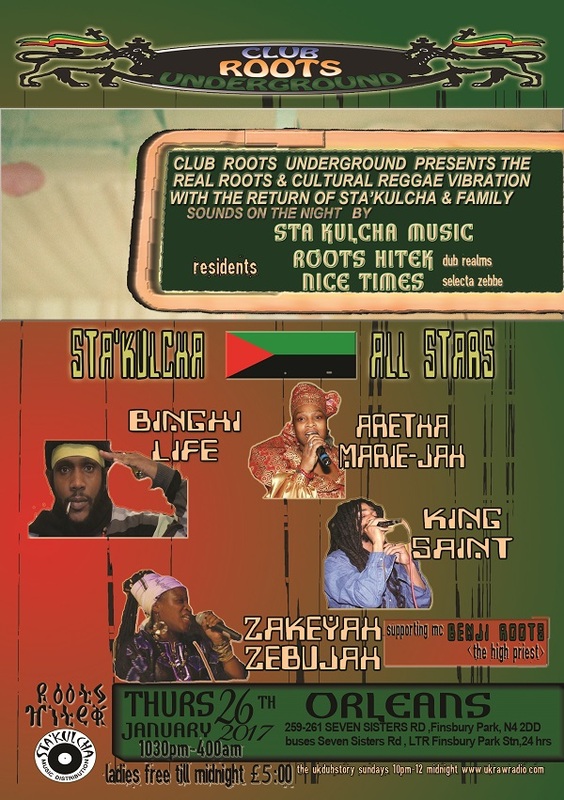 "Club Roots Underground in conjunction with Sta'Kulcha Music Promotions proudly presents a night of Roots Music. After a wonderful 'First' at Club Roots Underground STA'KULCHA MUSIC returns with a very special selection and a very upfull line-up/showcase feat. four cultural warrior starlight artists from the London scene: BINGHI LIFE, ARETHA MARIE-JAH, KING SAINT, ZAKEYAH ZEBUJAH will be setting the place on fire for a necessary strong 2017 start. From them we should expect no less than 1st class uplifment! STA'KULCHA will be playing a one away selection of Real music including foundation and current/new releases, and will also be supported by none other than M.C. : BENJI ROOTS 'The High Priest'. And we also expect distinguished mc's to be passing through! COME RALLY 'ROUND FOR THE VERY BEST IN REGGAE MUSIC, THE HARDEST RIDDIMS & VOCALISTS, YOU WILL NOT REGRET IT! Starlight Artists on the night: BINGHI LIFE, ARETHA MARIE-JAH, KING SAINT, ZAKEYAH ZEBUJAH + Supporting MC: BENJI ROOTS THE HIGH PRIEST. MAKE IT A DATE & DON'T BE LATE!!!"